If the great Charles Dickens were alive today, no doubt he’d be a Saints fan, as this year’s team has illustriously displayed the best and worst of times. On a Sunday night not long ago, the Saints handled the best quarterback in the pro game today, Aaron Rodgers, and dismantled the Packers, looking every bit the title contender they were consensually anointed to be in the pre-season. They lost on just a play twist or two to the 49’ers, after valiantly working their way back from a significant deficit. And nobody thought the Saints would win in Pittsburgh. There have been warning flags all year about this team, from the ill-advised off season departure of Darren Sproles, to “Super Bowl Swagger” reported at training camp, but none more vivid than their pathetically lackadaisical disposition in how unprepared they were in hosting Cincinnati. The script repeated itself, downright caromed, last Sunday against lowly Carolina, over whom they were deservedly favored, having already spanked them earlier this season at their place. 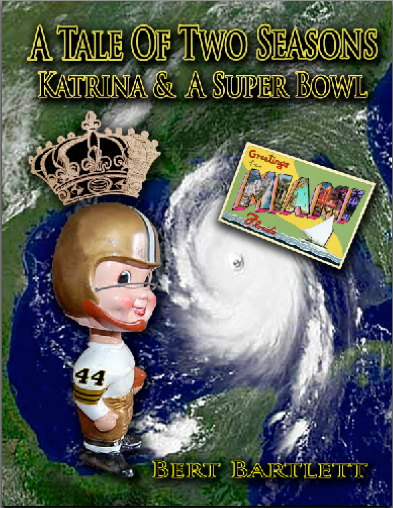 The debacle against Carolina, the most lopsided loss in the Payton & Brees era, had a few revelations. It was no contest from a coaching perspective. After months of ineptitude on offense, the Panthers decided to unleash Can Newton and dust off the spread, letting him attack with his legs as much as his arm, which caught coordinator Rob Ryan and his defense woefully off guard, with an abysmal lack to adjust. Time and time again, the Saints were lined up with one tier of players on the defensive line, with no linebackers or anyone else staying home to protect the line of scrimmage. Once Newton escaped the pocket, for him, it was off to the races. The Saints were guessing – delaying their instincts – all afternoon while the Panther offensive line swallowed their opponents for lunch. Over the years, the Saints have been superb in coming back from deficits by putting together a drive and getting any kind of points before halftime. This has been a real feather in their caps. It was role reversal on Sunday, the Panthers putting together a long touchdown drive, the Saints discernibly reeling on their way to the locker room, as if having been tasered by stun guns. Yep, so out of sorts were they that after that, they basically quit. The long touchdown run by Carolina’s untouched running back off tackle to open the third quarter was just a formality. Afterwards, Drew Brees told the media everyone needs to be mentally tougher. Having watched too many Saints games to count since 1967, rarely did I not stay tuned while they were on the wrong side of routes, if only ghoulishly to see how they played it out, and what the reactions were. Like the team, as a fan, I quit also, my viewing finished at 38-3, before the fourth quarter. Announcer Jim Henderson reported plenty of fans left the Superdome at halftime, not typical of New Orleans attendees. The loss or the slaughter that was the 41- 10 final score doesn’t really change anything. If only because of the weak sisters in their division, the 2014 Saints remain competitively relevant because they can still win the NFC South and host a playoff game. This is the only bow tie that can be accentuated with the rumpled Black & Gold suit that this year’s team is. After all, this is basically an in and out bunch that fans are keeping the faith with, that they can get hot at just the right time. Naturally, everyone is scratching their heads for explanations why the Saints have been so unpredictably erratic. The most common sense is deduced from the locker room. Safety Kenny Vaccaro revealed that influential personalities from last year are no longer on the roster. But guys like Smith, Harper, Jenkins, and Vilma were not making enough of an impact to stay on the team. But indeed, there are lots of new faces, and the players likely have cliques – over each other’s backs. The media loves to tout individual leaders on football teams, typically quarterbacks, but the locker room reality is that regardless of who likes rap or who likes country music, or who hangs out with whom, what matters most is how much “oneness” and trust the players feel about one another on the field, regardless of position. The resultant team characteristic that can be perceived is attitude. At its best, this becomes playing for a cause greater than self, which is exactly what the now nostalgic 2009 champs did. Along these lines, Coach Payton did choose a remote West Virginia location for training camp to focus and bond this team, but maybe it should have been in Europe or somewhere where the English language is in the minority. This bunch has the collective mojo of just a bunch of guys with briefcases cashing checks, with an alarmingly frequent sense of complacency. No Grits. Up in Washington, Jay Gruden is acting like a head coach with the overdue benching of Robert Griffin III. After the Redskins got drubbed by the Rams, he remarked that playing pro football is exciting and a privilege, and he expects pro football players to be motivated, and that if the team has pro football players that aren’t motivated, then it’s time to find new pro football players that are motivated. We like that. And get it. A similar evaluation challenge awaits the club’s front office for 2015. Meanwhile, Dickens would care less about the paltry record and be looking forward to next Monday night’s game in Chicago. Yet he’d pull for the Saints with No Expectations, versus Great Expectations. Souls Of The Saints wishes everyone Safe & Happy Holidays. Bert, enjoyed your recent blog. Keep me posted! Thanks Anita…will be great to see you in March.